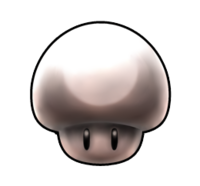 The Heavy Mushroom is an item in Mario Kart Arcade GP, Mario Kart Arcade GP 2, and Mario Kart Arcade GP DX. Upon being used, the Heavy Mushroom will turn the user into metal, much like a Metal Box. In this state, the user is so heavy that they will knock over any rival kart they touch, bringing the rival to a stop. The effects of the Heavy Mushroom wear off after approximately 5 seconds. This page was last edited on February 23, 2019, at 15:51.